#275 One Perpetual Use License plus training videos and example book. Compatible with PC and MAC, Excel 2010-2019 and Office 365. More about "QI Macros Starter Kit"
More about "SPC Simplified System"
Compatible with PC (Excel 2010-2019 and Office 365) and MAC (Excel 2016, 2019 and Office 365). Quantity discounts and shipping applied at checkout. More about "QI Macros Add-in for Excel"
5-License Pack of QI Macros For Excel. 3-License Pack of QI Macros For Excel. This 94 page example book (included in QI Macros Starter Kit and SPC Simplified System) contains examples from healthcare, manufacturing, and service industries to show you how to create and interpret each template or graph, and the associated metrics. 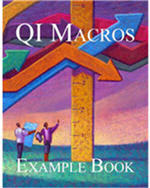 More about "QI Macros Example book"